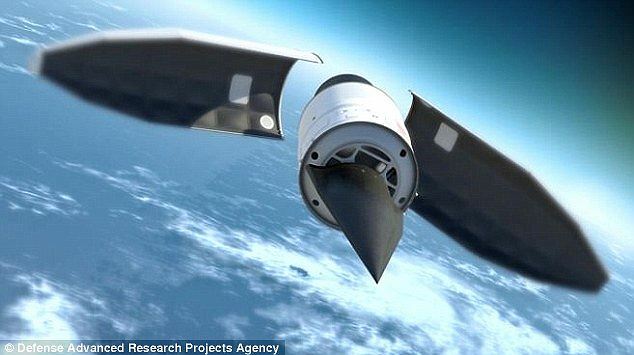 A hypersonic flying missile that can strike a target anywhere in the world in just 30 minutes has been unveiled by the U.S. military. 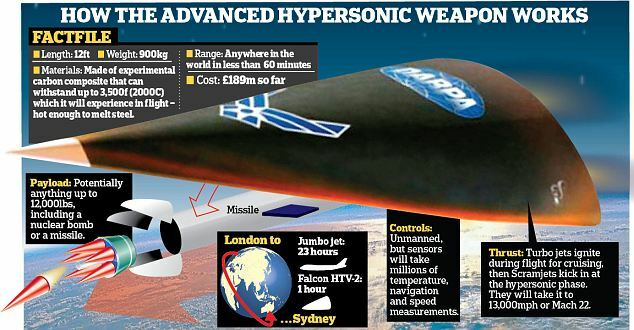 The Advanced Hypersonic Weapon (AHW), which travels five times the speed of sound, was successfully tested yesterday. It was launched by rocket from Hawaii at 11.30am, glided south westwards through the upper atmosphere over the Pacific at 'hypersonic speed' before hitting its target on the Kwajalein atoll in the Marshall Islands - some 2,500 miles away. It comes hot on the heels of the U.S. Air Force announcement that it has taken delivery of eight, 15-ton bunker buster bombs, called the Massive Ordnance Penetrator, that can blow apart 200ft of concrete. And if it is rolled out by the U.S. military, it will mean America will no longer have to rely on stationing missiles in foreign countries. Spokesman Lieutenant Colonel Melinda Morgan said the test was aimed at gathering data on 'aerodynamics, navigation, guidance and control, and thermal protection technologies'. The U.S. Army's AHW project is part of the 'Prompt Global Strike' programme. It seeks to give the U.S. military the means to deliver conventional weapons anywhere in the world within an hour. 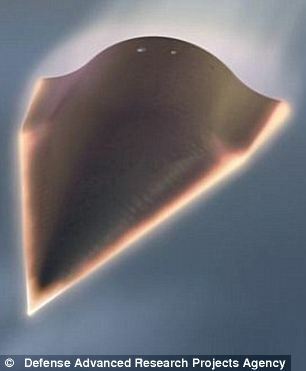 Scientists classify hypersonic speeds as those that exceed Mach 5 - or five times the speed of sound - 3,728 miles per hour. On August 11, the Pentagon test flew another hypersonic glider dubbed HTV-2, which is capable of flying 16,776 miles per hour. But it was a failure. The AHW's range is less than that of the HTV-2, the Congressional Research Service said in a report, without providing specifics. Despite half the circumference of the earth at the equator measuring 12,450 miles, the maximum distance travelled by the AHW will be significantly less, as it will follow a trajectory rising into the upper atmosphere before making its descent. The Pentagon has invested $239.9 million in the Global Strike program this year, including $69 million for the flying bomb tested yesterday, CRS said. The news comes the day after the USAF revealed it would now be using the 15-ton bunker busting Massive Ordnance Penetrator bombs. B-2 Stealth Bombers will use the six metre long GPS guided rocket, dubbed the Big Blu and fitted with 2.5 tons of explosives, to smash open underground bunkers and tunnels suspected of containing weapons of mass destruction. The delivery of the super bomb, and testing of the AHW, is in the same week U.S. President Barack Obama said America would act firmly against any nuclear proliferation activities by North Korea. And it comes as an International Atomic Energy Agency report renewed calls for a pre-emptive strike against Iran's nuclear facilities.